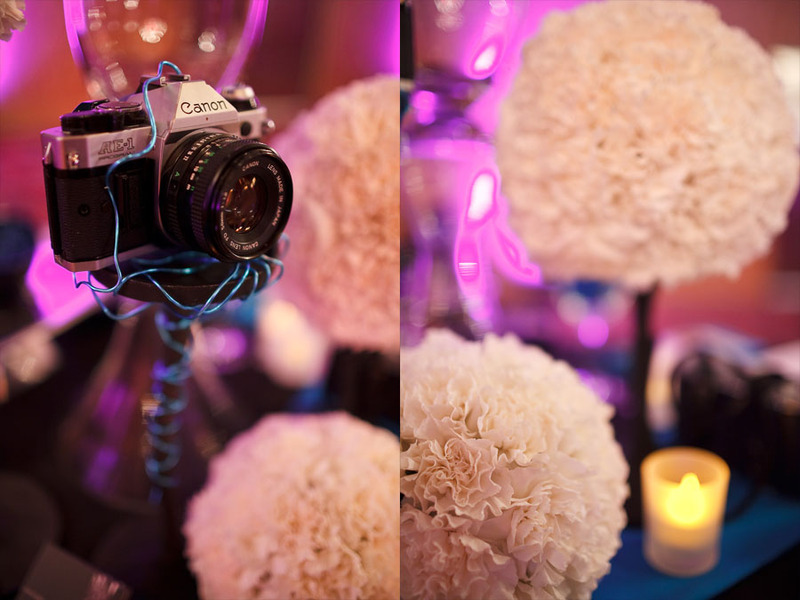 Two weeks ago, I had the privilege of being part of Fortune Austin‘s 1st ever bridal show. It was organized by the team at Red Velvet Events, and Sarah did an incredible job bringing in some of Austin’s top wedding vendors, including Illios Lighting, Marquee Event Group, Simon Lee Bakery, The Joey Colarusso Trio, King Florist, Floral Renaissance, Little Wex Makeup, FaceKandy, Say Cheese Photobooth, and fellow photographer Stefano Choi. Above: Setting 1. An iPad I bought on the way down to Austin set on top of a black plate, on top of an aluminum placemat from IKEA. 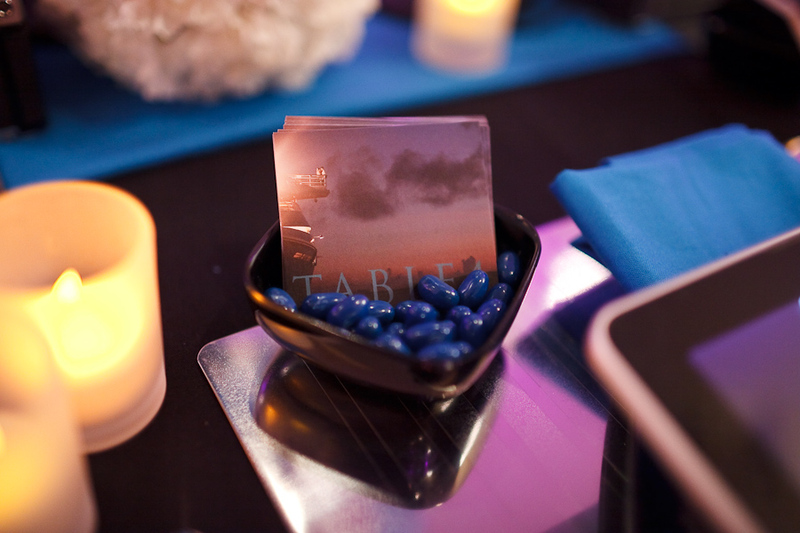 A folded teal napkin sits between the iPad and plate, adding just the right amount of color. 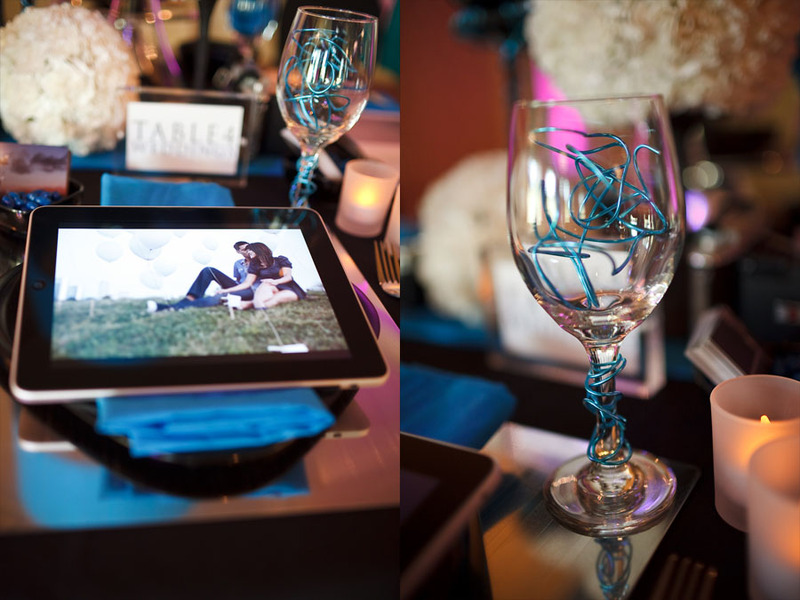 A wine glass with some teal wire twisted in and around it (Thanks Nita!) and fancy flatware flanked the placemat. The iPad was loaded with portfolio images and was in slideshow mode all night. Above: Setting 2. 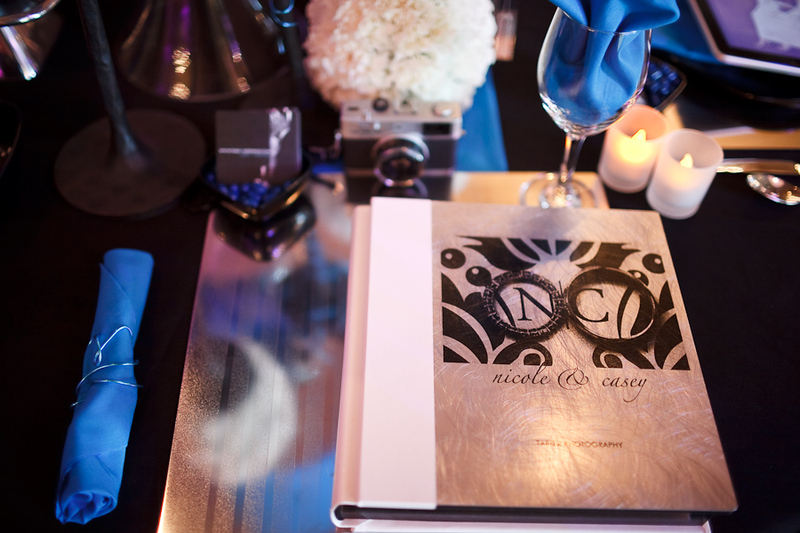 A 10×10 flushmount wedding album with aluminum cover on top of another aluminum placemat, with flatware wrapped in the teal fabric. 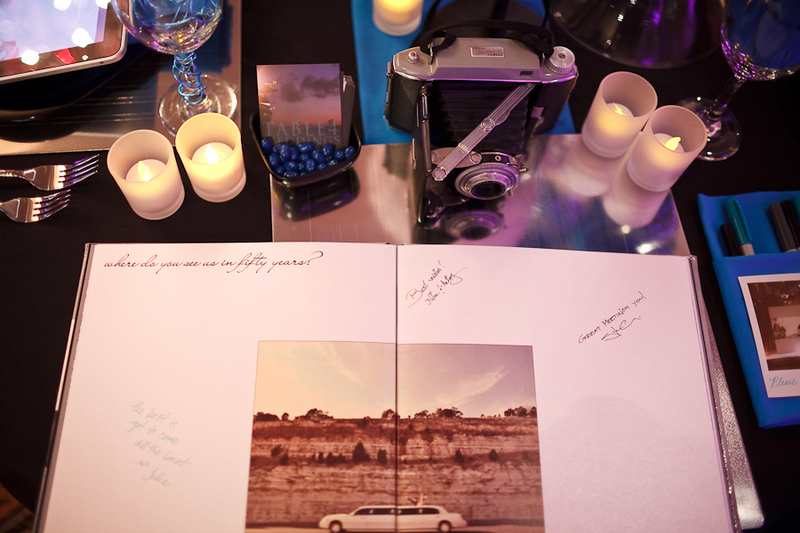 This album was a full wedding and brides could flip through seeing what an actual Table4 wedding album looked like. Setting 3: A custom 10×10 engagement sign in book. I cleverly had the guests and other vendors come by and sign the book as they passed by my table. One guy wrote, “Great meeting you!” ….Thanks! Nita also picked up these small dip bowls and teal colored jelly beans. I had custom square cards printed for the event and placed at each setting. I want to point out the big vase and lamp shade as well. 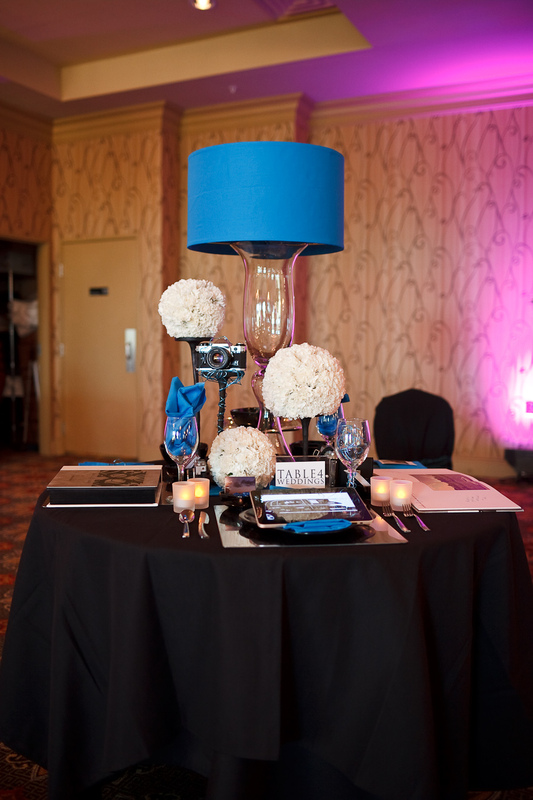 The teal lampshade was eye catching and helped my table stand out from the rest of the group. The height of the vase and lamp shade added a significant amount of interest and sophistication. If you couldn’t tell, I’m really proud of the table. Like, really proud. 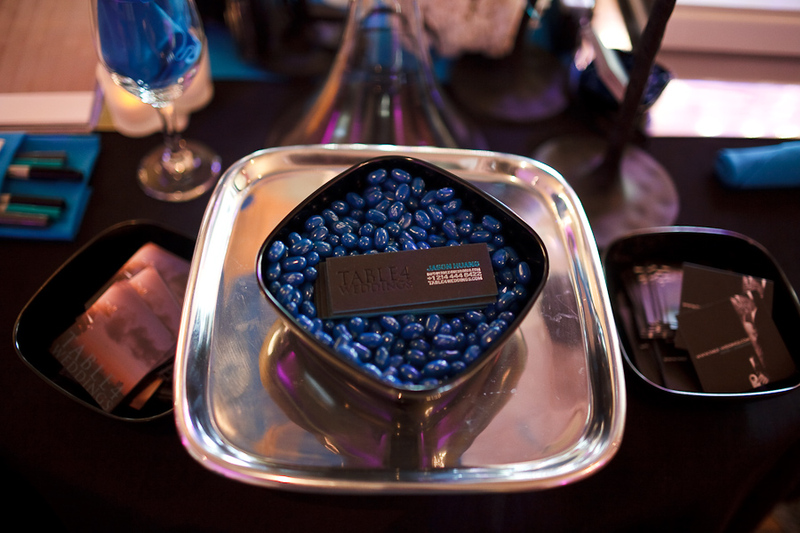 One of the bigger bowls had a bunch of jelly beans in them as well as my super fancy letterpress cards. Right before I left Dallas, I decided to pack my vintage cameras thinking it would help people understand what I did. It actually didn’t. 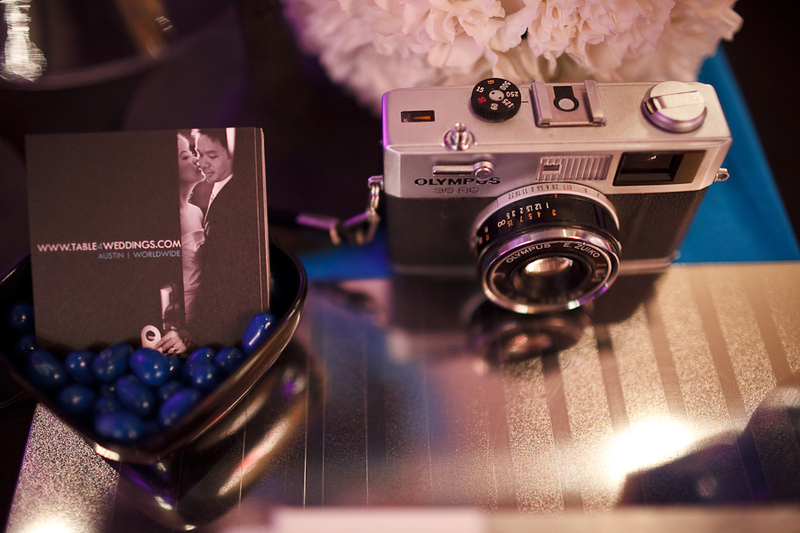 The design of the table was so good people kept asking me if I was a designer throughout the night…..despite all the photos and cameras. Thanks a lot Nita. Thanks again to Fortune and Red Velvet Events for hosting this event! I had a great time meeting people and schmoozing with some of Austin’s finest wedding vendors! Also, a HUGE thanks goes out to my friend Nita! She recently put her floral and wedding design career on hold as she plans for her own wedding in September. I’m thrilled she took on this project and I’m so happy with the results. I’m also honored to be part of her wedding and not have to work that weekend, but… I’ll probably still take a few photos.